Malware Removal: Removes any malware present in your PC. A malware can harm your PC and make it slow. Privacy Sweep: It means it clears your browser cache. Internet Boost: Boosts up your internet by stopping irrelevant programs that use internet data. Registry Defrag: It defrags the fragmented data in your windows registry which can slow down your computer. When you install any software it also gets added to the registry of your PC. Security Defense: It downloads some important updates which are required for the security of your PC. It works only when internet connection is available. Vulnerability Fix: It is also somewhat similar to Security Defense but it is different in the sense that it minimizes the vulnerability of your PC towards viruses or any outer harmful attacks. It also requires internet connection. Registry Fix: Registry is an important part of a Windows PC. But when it gets populated with some unwanted junk files due to different activities such as uninstall of an application, updates etc. then it slows down the PC. So registry fix is the feature by which Advanced System Care cleans up the registry and thus speedup the performance of your Windows PC. Junk Files Clean: Our PC creates lots of junk files through different activities. Junk files include temporary internet files, deleted files, icon cache and so on. So, this feature cleans up these junk files which add up to the performance of your PC. Shortcuts Fix: It fixes or removes those desktop shortcuts which do not point to a valid application. System Optimization: It optimizes the system in different ways using advanced techniques. Disk Scan: It scans the hard disk for errors and repair it if found. It works on next system reboot. Disk Defragment: It defragments the fragmented files on your hard disk. IObit Uninstaller: This is an advanced uninstaller and better than the Windows Uninstaller. When we normally uninstall an application, it doesn’t get fully uninstalled, some its files, folders and registry entries are left out. So we need an advanced uninstaller like IObit Uninstaller to completely uninstall an application from our PC. Startup Manager: If PC takes a lot of time to start then one of its causes may be the number of startup applications that start when your PC starts. Startup Manager shows which applications start at startup. It allows you to stop those unwanted startup applications. 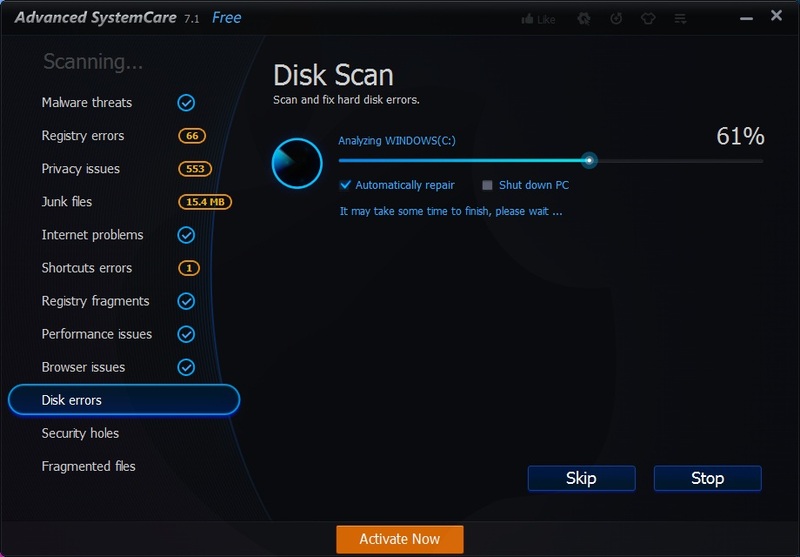 Disk Doctor: It is an advanced tool to repair your disk from errors and also protects it. It analyses your disk and shows up if any problem exists. Note: Some tools are not directly available with the download but you can later on download those tools from the Toolbox. 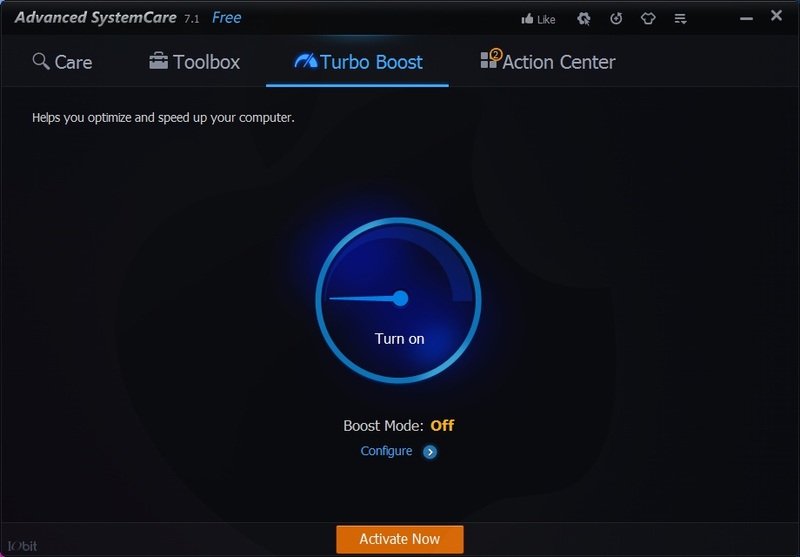 Turbo Boost is an easy to use tool. It gives a one click boost facility. Actually it releases the RAM memory according to the working environment you choose. It stops those unwanted memory eating applications and boost up your PC. It has two modes Work Mode and Game Mode. It also allows you to configure which programs to stop and which not. I must say it is a most likable feature of this application. 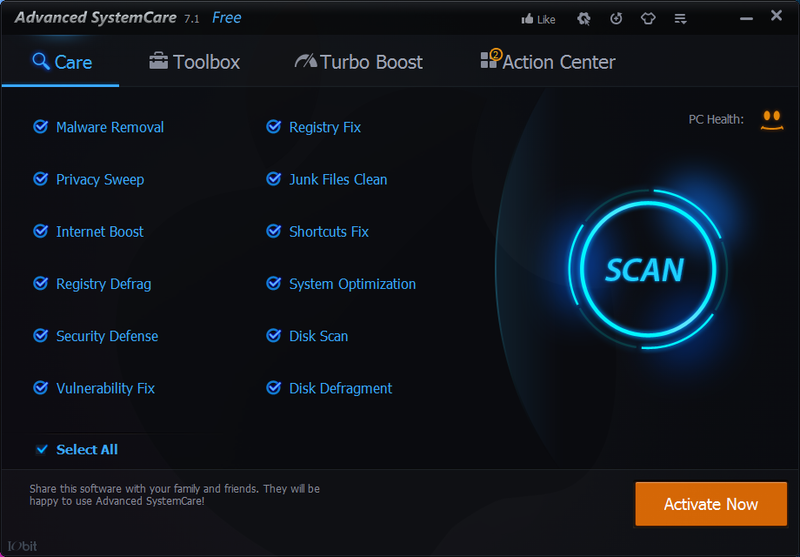 So, IObit Advanced System Care is a must have application for any PC. It takes care of your PC a lot. According to me it is the best application of its type. 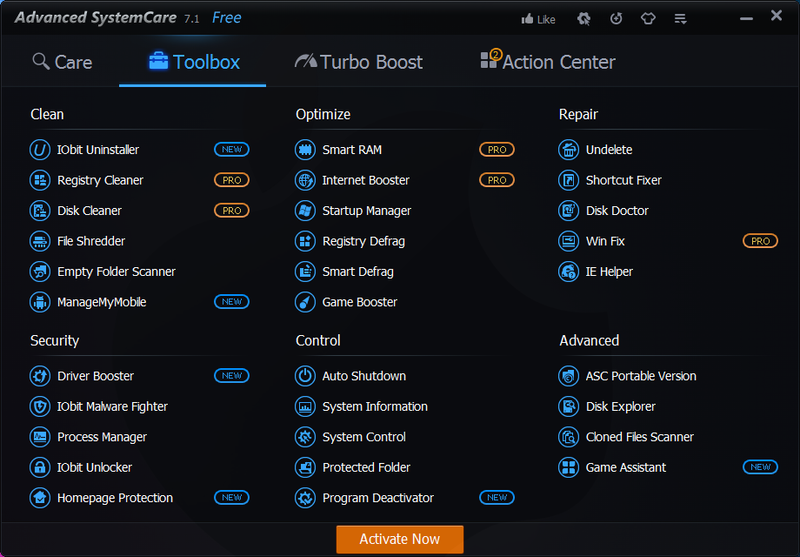 If you liked the application and want ultimate care for your PC then you can upgrade it to IObit Advanced System Care Pro. Upgrade is very easy and it can be done through the application itself. Just click the Activate Now button as in the above screenshots and give the license code or purchase the software. is it better than tune up utilities? Yeah, it can be said better in many aspects. Its free version is enough to tune up your PC. ASC is simpler to use and does its job smoothly.